Click here to visit the Walmart site and let it load. Then play their this or that game at the top of the page. Once you’re done, just fill out your name and email to enter their sweepstakes (UPC not needed). There will be a total of 81 winners selected. You can enter up to 3 times per day until May 30th. 20 winners – $50 Wal-Mart gift card. 10 winners – $200 Wal-Mart gift card. 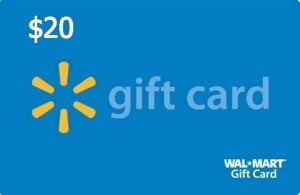 50 winners – $20 Wal-Mart gift card. 1 winner – $1,000 Wal-Mart gift card.